The Judicial Performance Commission recommends that the Honorable Suzanne A. Grant BE RETAINED by unanimous vote with no abstentions. Judge Grant earned a Bachelor of Science degree from the University of Wyoming in 1976. Judge Grant was appointed to the bench in August of 2007 and was a secondary school science teacher prior to serving as the Crowley County Judge. A long-time resident of Ordway, Judge Grant also devotes time volunteering in her community and serving as a member of the Otero Junior College Advisory Board, the County Judges Association, and the State Judicial Advisory Board. The Commission reviewed the results of the 2014 Judicial Performance Survey Report gathered from litigants, jurors and attorneys who appeared before Judge Grant during the years 2010-2013. Responses during that period showed Judge Grant’s overall grade on a 4.0 grade point scale was a combined 2.86, with attorney’s giving Judge Grant a grade of 2.82 and non-attorneys giving Judge Grant a grade point average of 2.89. Of all attorneys surveyed about retention, 74% recommended retaining, 20% recommended not to retain, and 7% made no recommendation. Of non-attorneys surveyed, 64% recommended retaining, 25% not to retain, and 11% made no recommendation. (These percentages may not add up to 100% due to rounding.) The Commission notes, however, that the survey sample size is extremely small with only 92 total survey participants in over four years. The Commission conducted a public hearing held at the Crowley County Combined Court. All Commission members observed Judge Grant working in the courtroom and thoroughly reviewed written materials provided by the Judge, the Court administrative staff, interested parties, citizens, and attorneys, as well as case statistics for Crowley County Court. Finally, the Commission met with Judge Grant and conducted an interview with her, discussing the evaluation process and any and all concerns of the Commission. The Commission first notes that Judge Grant has approached the evaluation process in an open and reflective way. She has in every way appeared eager to ever-improve her work as a judge for Crowley County. 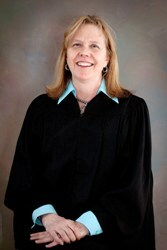 Judge Grant, though she had no prior background in the legal profession and is not a lawyer, takes the law and the public trust she enjoys extremely seriously and has expended great time and effort to become familiar and experienced with applying the substantive and procedural law of Colorado. The Commission did note, however, that at times Judge Grant did not exude an air of confident control of her courtroom. The Commission encouraged her to further “take charge” of the proceedings, to speak with greater authority, and to make a confident record explaining her rulings and orders. As would be expected of a non-attorney judge, Judge Grant could also benefit from a greater knowledge of the application of Colorado law. Overall, more thoroughness and clear, logical legal reasoning in her written and oral rulings was encouraged. For her part, Judge Grant does appear willing to continue to improve and seems dedicated to expending the efforts necessary to develop further competence as the Crowley County Court Judge.